May 23 2017. As noted in the first installment of this recap, the USATF Masters Half Marathon Championship was held in sunny Southern California on the 7th of May 2017. 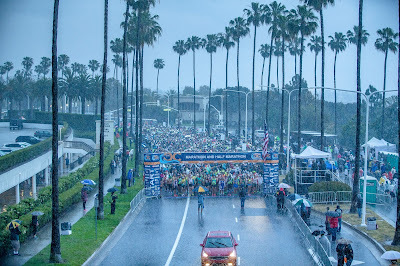 The race runs from a fancy mall, Fashion Island, in Newport Beach, around the mall and then down to the seaside village of Corona Dell Mar, along the front with a view down to the sea, and then another sustained downhill until runners pass over a bridge at the lowest point between miles 6 and 7. Then from 10K to 10 Miles, there is a substantial up slope as the runners wind their way back up to the Orange County Fairgrounds in Costa Mesa. The finishing elevation is lower than the start but it does not feel like a downhill race overall because you get the uphills in the third portion of the race, between 10K and 10 Miles. The other hitch was that we got the 'liquid sunshine' version of So Cal for 20 minutes before the start of the race. At 5:55 am it was dark and the rain started to come and it got heavier and heavier until it was a downpour. The rec runners were sporting their plastic raincoats and make-shift raincoats from plastic trashcan liners. The Masters Elites were lining up, as usual, in their racing gear, singlets and shorts. Pretty soon it would be time to race! Men 60-64. 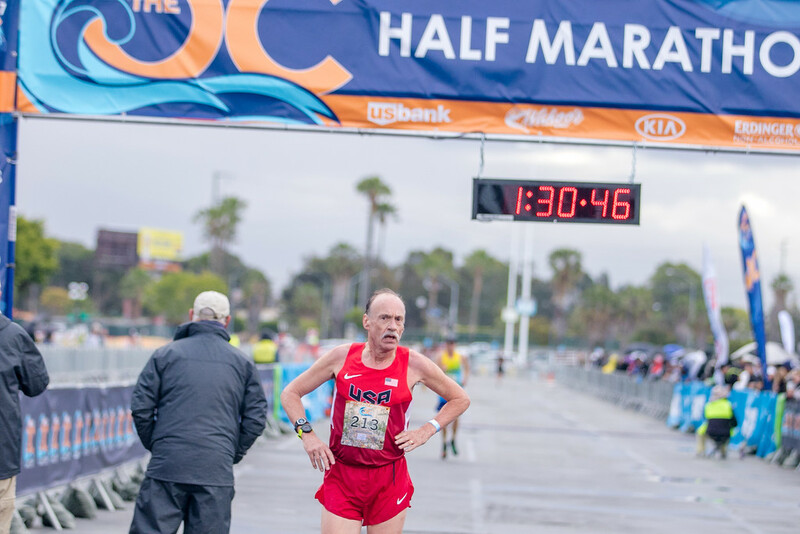 Cal Coast's John Holcomb, who finished third in last year's Masters HM Championship in San Diego, was the closest to being a Defending Champion. There were three new challengers who would give him a race. 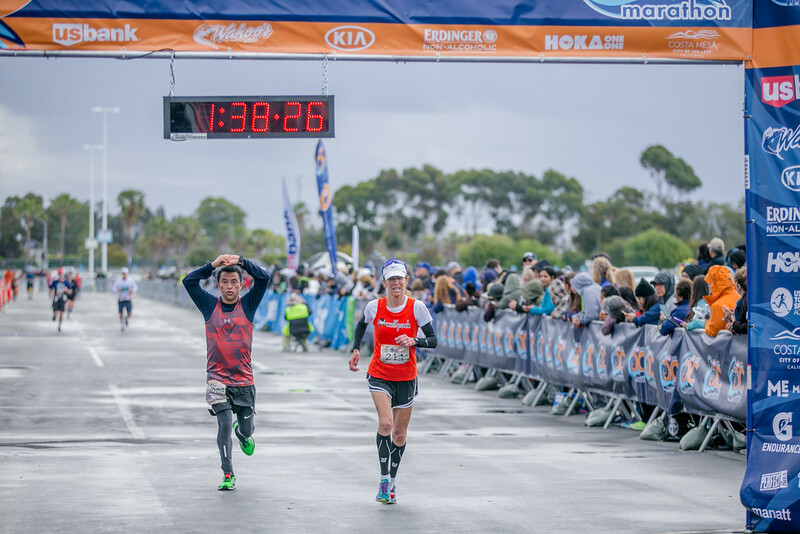 Hawaiian Greg Wilson who runs for the San Diego-based Bonita Road Runners, ran a 1:01:31 15K earlier this year, a bit faster than Holcomb's 1:02:39 in the Masters 15K Championship in Tulsa last year. But that race course is hilly and challenging so the times might be closer than it first appears. Wilson does appear to have greater speed at 5K with an 18:35 at Carlsbad to compare with Holcomb's 19:01 on the equally fast course at Syracuse. Two others that would be in the heart of the race included local Masters Elite runner, Sheldon Subith and midwesterner, Daniel Lillyman. Subith ran a recent Trail HM in 1:28:40; typically trail races are slower than road races because of terrain and footing although there are exceptions. Lillyman uncorked a terrific 1:24:08 at the RnR New Orleans HM in February but ran a more modest 1:26:36 HM in Illinois in April. Either result would put him in the mix for the podium and possibly a win. If Holcomb and Wilson were anywhere near each other at the start, Wilson will have been surprised at the pace Holcomb set. He must have stretched it out a bit on the downhill portion a she hit the 5K mark in 19:31 with an 18 second lead on Wilson. Subith and Lillyman were close together in 3rd and 4th about 20 seconds back from Wilson. Holcomb continued to pour it on for the next 5K which is mostly level but includes a long downhill stretch around mile 4 and then flattens out until runners pass over a bridge at 6.5 miles. Holcomb added another 32 seconds to his lead over Wilson as he covered the 2nd 5K in 20:15. Whether Wilson was struggling a bit during this stretch or Subith was just gradually accelerating is hard to say, but Subith closed to within 7 seconds at the 10K, and now led Lillyman by over 20 seconds. Right after the 10K mark, runners cross a bridge which is followed by a significant uphill at mile 7, lasting over a half mile. There are two smaller hills just before mile 9 and then again before mile 11. These last two could be described as 'rolling hills' but at that stage of the race, runners definitely see them as 'real' hills. By attacking the hills, Holcomb pretty much slammed the door on his competitors. He was one of the few athletes to run at a faster 5K pace over the 10K to 10 Mile stretch than their 2nd 5K. Holcomb lowered his 5K pace from 20:15 to 20:03 and lengthened his lead to over a minute and a half. Wilson did almost as well although with a much slower pace overall but at least he was able to keep up that pace; otherwise Subith would have shot past. As it was, they were dead even at the 10 Mile Mark. Lillyman was now over a minute back from that pair and would only be a factor if he had saved a lot for the final 5K. Holcomb had no problem over the final 5K crossing the finish line with a fine 1:24:56. Not many runners who competed in the HM Championships in both 2016 and 2017 had a faster time this year, but Holcomb was one of them! At some point Wilson was able to surge away from Subith and stretch his lead back up to over half a minute. Lillyman was able to take 5 seconds out of Subith's lead over the final 5K but still finished over a minute back in 4th, not his day. 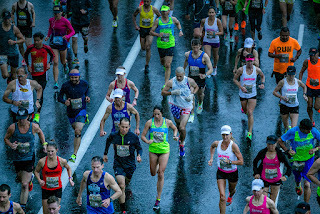 Considering that the race falls about 50 meters in the first 10K and rises about 16 to 17 meters between there and the finish, one would expect runners to carry a faster pace for the first 10K than the final 6.9 miles, unless they are aiming for a sharply negative split (in terms of effort level). Holcomb covered the first 10k at a scorching 6:24 pace per mile; the others were all over 6:30. Holcomb's pace actually slowed more than any of the other runners, by 9 seconds per mile but he still carried the fastest pace over the final 6.9 of 6:33 per mile. Wilson was pretty close to running an even pace in terms of effort level; his pace only slowed from 6:32 per mile to 6:37 per mile. Certainly it was a fine effort all around from the M60 group. John Holcomb 1:24:56 Greg Wilson 1:26:12 Sheldon Subith 1:26:49. Women 60-64. Last year Honor Fetherston, although not pressed for the win, had three other contenders to deal with. This year only one other competitor made it to the starting line, Joanna Harper of Team Red Lizard. After the horn souded it became clear that unless Fetherston ran into trouble, she would be the national champion from this division. She covered the first 5K at a 7:32 per mile clip and established a gap of over two and a half minutes to Harper. Make no mistake, Harper was running well, but few in this division can stay with Fetherston. Fetherston built her lead throughout, carrying a faster pace in the rising third segment that the second 5K. She won the championship by a large margin, with Harper claiming the Silver Medal. Fetherston ran a very even pace, 7:32 for the first 10K and 7:34 per mile for the last 6.9 miles. Men 65-69. Peter Mullin was back to defend his title, won in 1:26:30 last year. He as run two half marathons this year, winning his age group at the Aramco Half Marathon in Houston and the Half marathon at the World Indoor Track Championships, in 1:26:36 and 1:26:40 so he has been remarkably consistent. Here is a question. Mullin won the Half Marathon on an outdoor course, not indoors. But the race was part of the World Indoor Championships. Is Mullin considered the World Indoor Half Marathon Champion? That would be quite a distinction. One competitor who would ordinarily give Mullin a stiff challenge is 2015 M65 Runner of the Year, Lloyd Hansen. But Hansen has not run much since last year when he encountered a sciatic nerve problem. He has been able o train but not as intensively nor as consistently. Despite the problems, Hansen is battling back; he has run Half Marathons recently in the 1:34 to 1:38 range. But that is not likely to be fast enough to match Mullin. The other contender, John Hirschberger, is likely to be closer to Mullin. He ran two HM's last fall in 1:30:26 and 1:31:17; this spring he has run a 1:09:24 Ten Miler which is roughly in keeping with the HM results. The other competitor, Cal Coast's Glenn Colehamer, is a strong runner, but would not be expected to be close to those three. As expected, Mullin set the early pace, passing the 5K mat in 20:31 with a 2 minute buffer back to the chasers, Hansen and Hirschberger. Hansen believes in getting out quickly, viewing it as very hard to make up ground later in the race. Two years earlier he would have been with Mullin but given his last year he was probably happy to have only Mullin ahead of him; he had 7 seconds on Hirschberger. Mullin stretched his lead over the next 5K to over 2 and a half minutes. Mullin continued to stretch out his lead over the last 6.9 miles, slowing from the 6:44 per mile pace he carried for the first 10K to 7:08. Whether from a niggling injury or being drenched at the start or just a lack of motivation, Mullin did not attack the course with the same fervor that he has recently. He still took the Gold Medal by over 3 minutes. But he was well off his normal pace, with a minute or two of that no doubt due to the course and the day. Hirschberger meanwhile had pulled even with Hansen by the 10K mark which they passed within two seconds of each other. Hansen's current fitness level did not allow him to fight Hirschberger off; by the 10 mile mat, Hirschberger was able to open up a half minute gap. Hirschberger powered home to take second by over a minute, with Hansen getting the Bronze medal. Colehamer took 4th. Women 65-69. Jeanette Groesz was the big story in this age division. She had run 1:17:14 in the Pear Blossom 10 Miler earlier this spring; that is age-graded equivalent to a 1:42. Initially it looked like Groesz and her Red Lizard teammate, Suzanne Ray, would go 1-2 but Ray did not run after all. That left Groesz alone by herself as far as the age division goes. She crossed the 5K mat in 24:34 with a two and a half minute lead over Betty Wagner who had, in turn, over 9 minutes on the 3rd place runner, Jane Williams. Those gaps just grew bigger over the rest of the race. Groesz ran a very even pace, averaging 8:00 per mile for the first 10K and 8:02 for the steeper remainder of the race. Men 70-74. Richard Kutzner took the Gold Medal last year by 41 seconds over Przemek Nowicki. But this year Nowicki is nursing a hamstring and did not come. Kutzner knew he would not have it easy, though; Gene French and I (Paul Carlin) were entered as well. French beat Kutzner by almost a minute at the 8K Masters Championship in Virginia Beach in mid-March, and I came in 21 seconds ahead of French. I made it two in a row by coming in 56 seconds ahead at the 10K Masters Championship in Dedham MA the week before. But the narrowing of the gap suggested that it might narrow further as the length of the race increases, and could flip between 10K and a Half Marathon (about 21K). In fact Kutzner and I have only competed at one longer race before this, the 15K at Tulsa last year, and Kutzner took it in style as I had to nurse my hamstring through the race. And Gene French came in ahead of me at Club XC last year so everyone had reason to hope they might be on top at the end. The horn sounded and Kutzner apparently moved off smartly but French and I did not see him. French and I were both late arrivals and hurriedly lined up on the right side of the starting area; Kutzner was lined up on the left. French and I were essentially together for the first mile, although French was ahead of me after the first 400 meters or so. I did not know if Kutzner was even in the race but I knew, regardless, that French would make it a tough race to win. After the first mile we swung out of the Fashion Mall area onto the first major downhill portion; I lengthened my stride and found it carrying me up even and then past French. I learned later that Kutzner was ahead of me but I never caught a glimpse of him in the first 10K. Kutzner crossed the 5K timing mat in 23:20 with 33 seconds on me; I in turn had only 17 seconds on French who, I imagine , still had me in his sights. Things did not change much in the next 5K; Kutzner still had 31 seconds on me at that point. I had stretched my lead on French to over a minute, although I had no way of knowing that at the time. The next 3.8 miles with its significant uphill portion proved critical. There was a water and energy chew station between 9 and 10 miles. I took the time to pick up some chews, rip open the packet, spilling most of them on the ground in the process, but saved one to pop into my mouth. I figured I needed that one. Imagine my surprise when I looked up ahead and saw, for the first time, a lime green shirt with an 'M70' back bib. That was my first glance at Kutzner. I figured if I had caught up to him I would probably be able to pass him if I just eased back into my pace. And that's how it worked out. Later Kutzner told me that when I passed him he stayed with me for a bit but then figured I was finishing strong just like when I had passed him late in the 5K Championship in Syracuse last fall. And he was right, as I stretched the margin to over a minute by the finish line. French, at the 10 mile mark, was over a minute and a half back. It proved too far back to catch Kutzner. But over the last 5K, French cut the margin from over a minute and a half to just 21 seconds. Let's look at the 1st 10K/last 6.9 mile paces. Kutzner took it out at a 7:39 per mile pace for the first 10K, gaining 5 seconds per mile on average over me. I was gaining 11 seconds per mile on French. But Kutzner ran into trouble on the stretch from 10K to the finish, slowing to 8:03 per mile. I was able to hold a pretty steady effort level as my pace slowed only from 7:44 per mile to 7:47 per mile. French was one of the few to run what I have termed a strongly negative effort level split as he lowered his pace from 7:55 per mile to 7:52 per mile. 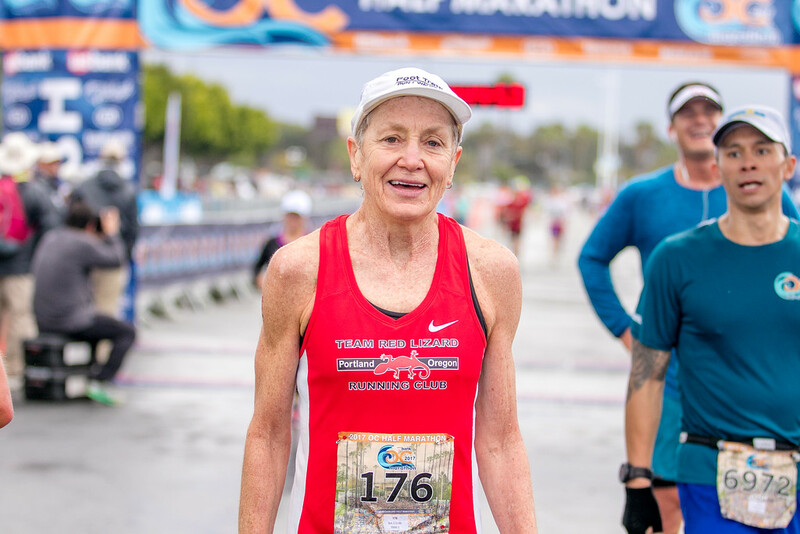 Women 70-74, New Mexico's Irene Terronez took the Silver Medal in 2017 in 2:21:45 but had the age division to herself this year. One might think that would reduce her motivation and lead her to take it easy. But that was not the case; she took almost two minutes off her time on a day when most ran slower than last year. Terronez ran a reasonably steady pace, averaging 10:37 per miel for the first 10K and 10:44 per mile for the remainder, taking the Gold Medal in 2:20:00. Men 75-79. The Atlanta Track Club's M70+ team made the trip west to contest for the win. Andrew Sherwood came to help his team win but at 77 years young, he joined Malcolm Cohen of the Ann Arbor Track Club in contending for this age division championship. Cohen, still in recovery mode and racing only with the permission and advice of his Physical Therapist, was in no shape to contest for the Gold medal but fully anticipated taking Silver. Sherwood set a 10:15 per mile pace for the first 10K and that was enough to establish a large lead. He covered the remainder of the course at a 10:44 pace, claiming the victory in 2:17:25. Men 80-84. The oldest competitor of the day, Richard Williams, 81, who runs for Florida Track Club West, was in a class by himself for this race. But he had to make it to the start and finish the race. On a day with a steady downpour right before the race, that would be no mean accomplishment. In fact, Williams did much better; he ran a negative split. He covered the first 10K at 10:36 pace, speeding up slightly to average 10:35 per mile on the hillier remainder of the race. That was a truly Gold Medal example of effective pacing! The Jane's got off to a good start as Ingrid Walters opened up a lead of about a minute on Cal Coast's 1srt runner, Keri Olson, Erika Aklufi had a couple of minutes on Mary Lynch, #2 for Cal Coast, and the Jane's 3rd runner, racing better than anticipated, had 20 seconds on Mollie Rosing That gave Cal Coast a 3 minute lead only 5K into the race. Over the next two portions of the race, those patterns continued; Walters having nearly two then over 2 minutes on Olson, and Aklufi with a minute and a half and then 4 minutes over Lynch. And Twit also maintained her lead over Rosing. Olson closed strong and did eventually pass the Jane's 2nd runner, Aklufi but that was not enough. Aklufi stretched her lead over Lynch. 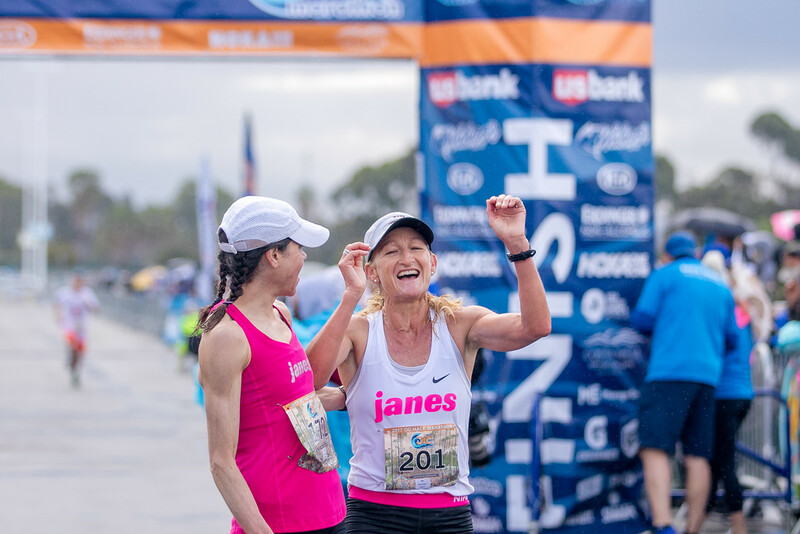 In the end the Jane's Elite had the victory by almost 9 minutes, averaging 1:29:10 to 1:32:03 for Cal Coast. Women 50+. The Jane's Elite Racing team is the defending Champion' they enjoyed facing a challenge form one of the top east Coast teams, the Athena TC. No doubt the Jane's were the favorites. The only question was whether their Captain, Tania Fischer, who was back on her game at the USATF XC Championships in Bend OR after a down year in 2016, would run strongly at the longer distance. Although, to be frank, the same question hung over Athena's number three runner, Margaret Sloan. As Fischer is the stronger runner at shorter distances, that likely gives the edge to the Jane's. If Fischer can run with her teammate, Kathleen Cushing-Murray, as she did at Club XC, the Jane's would dominate. In fact, Fischer and Cushing-Murray came first across the 5K timing mat, over 40 seconds ahead of Athena's number 1, Doreen McCoubrie, only 3 weeks removed from a strong Boston Marathon. Athena's #2, Mary Swan was another 30 seconds back and the Jane's #3 runner, Kelle Taylor, had over 40 seconds on Sloan. That gave the Jane's an early lead of two and a half minutes. All of those gaps continued to grow as the Jane's were up by over 6 minutes at the 10K mark and finished up with a 16 minute victory. They averaged 1:29:31 per runner. No doubt the Athena TC was happy to go home with the 2nd place finish, the cash prize and the 90 points toward the Club Grand Prix.The Jane's were even happier to defend their title and the home turf, and take home winner's money and 100 points toward the Club GP title. Men 40+. The Cal Coast TC and the Bowerman TC clash regularly on the XC paths but this is the first time in recent years that Bowerman TC has sent a team to contest for a National Road racing Championship. A four-runner team was entered but Greg Mitchell, who typically leads the way for Bowerman, had to scratch due to a hamstring issue. On the other hand, Cal Coast was without their #2 Half Marathoner from last year, Christian Cushing-Murray, also down with an injury. The two teams appeared pretty evenly matched. It would depend on how the day went. Cal Coast crossed the 5K mat wth just a 7 second lead. Cal Coast's John Gardiner had 18 seconds on Bowerman's Orin Schumacher, with the 2nd runners for both teams, Craig Magness and Duncan Roberts dead even. Bowerman's Joshua Gordon had 11 seconds on Cal Coast's Seven Frisone. Gardiner threw in a wicked second 5K and that added to Cal Coast's edge. Gardiner was well over a minute ahead of Schumacher now so even though the 2nd runners were still even, and Gordon now 14 seconds ahead of Frisone, Cal Coast pushed its lead to over a minute.Cal Coast gained another minute by the 10 mile mark as Gardener widened is lead somewhat, Magness gained a 5 second lead on Roberts and Frisone passed Gordon, reversing the gap to 12 seconds. The Cal Coast bunch maintained or grew those gaps over the last 5 kilometers to take the Gold Medal in 3:40:47 to 3:43:49 for Bowerman, an average of 1:13:36 to 1:14:37. The race for the Bronze Medal was resolved nearly 12 minutes later when Cal Coast's B team took the measure of the Prado Racing team out of San Diego. Cal Coast's Mark Steyvers, Gregory Keyes and M.J. Stanley all finished between 1:18:04 and 1:18:44. 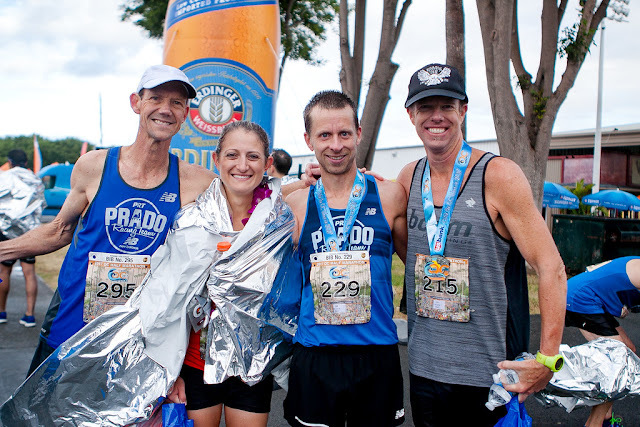 That made up for the fact that prado's top runner, Jason Batterson came in at 1:16:37. 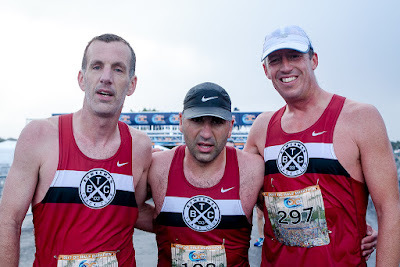 Prado's other two runners, Kevin Zimmer and Jeff Creighton, had off days and did not crack 1:20. Women's 60+.Team Red Lizard made the trip down from Oregon. Initially they no doubt expected to encounter the Impala Racing team who were defending champions. But the Impala team was not able to defend the title so it goes to the Red Lizard team in 2017 with an average time of 1:50:20. Men's 50+. 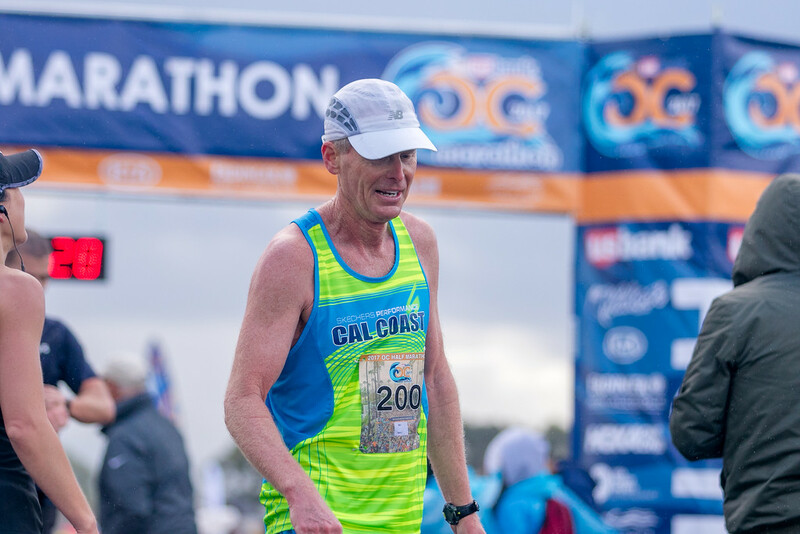 Cal Coast defended its title from 2016 despite their lead runner, Rob Arsenault still being in recovery mode. Last year it was Arsenault, along with Gustav Quinonez and Thomas Schumann, who took the title; Schumann returned, joined by Matthew Underwood and Dennis Ryan. They cranked out an average time of 1:26:42 to earn their gold medals. Men's 60+. It was a similar story in this category. Only John Holcomb of last year's championship team, was returning for Cal Coast. In 2016 he teamed up with Perrry Forrester and Keith Witthauer. This year he had the company of Charles Sanchez, Tomas Rodriguez, and Paul Cook. They averaged 1:28:51 in taking the 2017 title. Men's 70+. As with the Women's 60+, the Atlanta TC decided to make the trip anticipating that they might encounter either the defending champion Shore AC team or the Ann Arbor TC who finished 2nd. But Shore AC's top runner, Przemek Nowicki was rehabbing a hamstring injury so the did not come and Ann Arbor only had two runners. One of their teammates has an active international marathon schedule which did not afford him the opportunity to compete at this time. So Atlanta won in a romp, averaging 1:56:39 to take the title. That concludes the recap. The weather was not fully cooperative but, as Gary Kutscher, of the OC Marathon put it, I would much rather have the rain before the start, like today, and cool temperatures, than a really warm, sunny day. 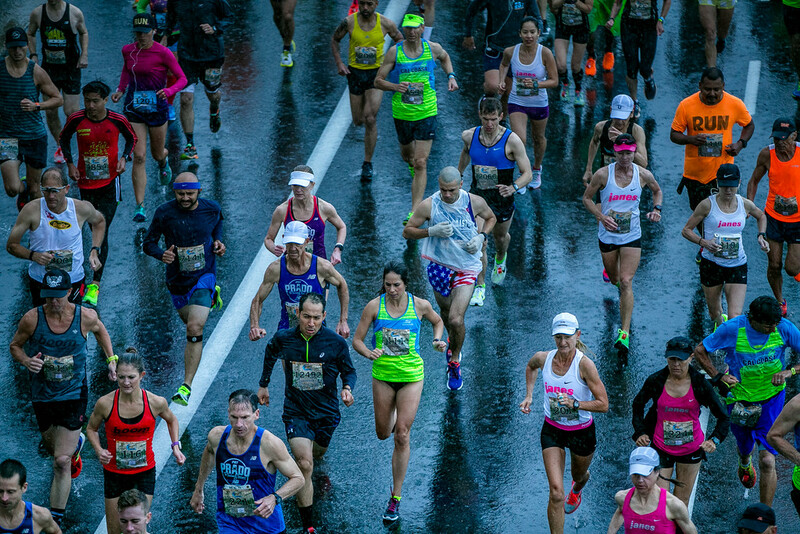 And certainly once the race was underway, the weather was not a major concern of the runners. The hardy runners took to the streets with aplomb and some were lucky enough to end the day as National Half Marathon Champion; all competed mightily. 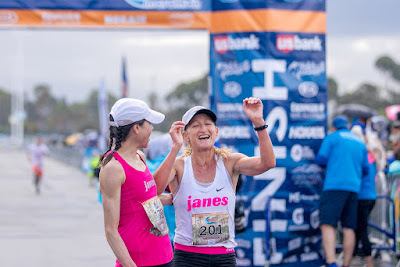 Photos courtesy of the OC Marathon. Photos by Paksit Photos. These are my unofficial tabulations for 'mythical' awards that are not currently offered by USATF--perhaps some day. Recall that those who finish in the top 5 overall positions in the race earn points--10-6-4-2-1.